Production on a new high-end frontload washer and matching dryer starts at GE’s Appliance Park in Louisville, Ky., the first time GE has built products of this kind in the U.S.
LOUISVILLE, KY. – April 22, 2013 – (NYSE:GE) – In Building 1 at GE’s massive Appliance Park, where topload washing machines have been built for about 60 years, two new assembly lines, costing over $100 million, have begun producing high-efficiency frontload washing machines and dryers. 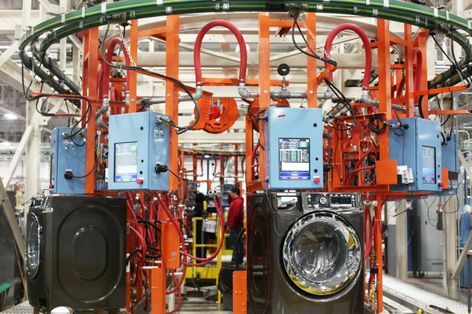 This is the first time GE has produced a frontload washing machine and matching dryer from one of its U.S. plants. The new products mean about 200 more jobs. 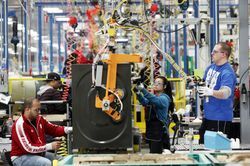 The startup of these two lines completes the new product platforms GE committed to bring to Appliance Park in a 2010 announcement that stated it would invest $1 billion to transform its U.S. appliances business and products. Since that announcement, GE Appliances has hired 3,000 new employees in Louisville, 2,500 in 2012 alone. 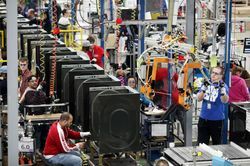 Two new assembly lines, costing over $100 million, have begun producing high-efficiency frontload washers and dryers, adding 200 jobs to Appliance Park in Louisville, Ky. 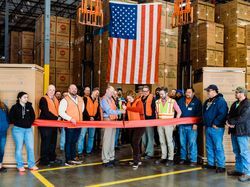 In 2012, GE opened two refurbished factories in Louisville to house the first of the new product platforms—the GeoSpring™ Hybrid Water Heater and French door refrigerator. It also added lines in two existing plants for new dishwasher and washing machine models. Also, as part of the $1 billion investment, GE is investing in cooking products made in Lafayette, Ga., top-freezer refrigerators made in Decatur, Ala., and side-by-side refrigerators made in Bloomington, Ind. GE engineers and industrial designers have made laundry day less taxing with a universally designed frontload washer and dryer built for every body. The GE® RightHeight™ Design frontload washer and dryer incorporate the industry’s largest openings and the first Built-in Riser™ to minimize strenuous bends and long reaches, no matter what your height. Approximately 59 percent of consumers purchase a washer based on its opening and how easy it is to access.1 Although manufacturers recommend buying pedestals to raise the height of their washers and dryers, about 60 percent of consumers forgo the added expense.2 Many owners skip pedestals and spend their time in the laundry room hunched over, loading and unloading clothes. The ENERGY STAR®-qualified GE RightHeight Design frontload washer and dryer pair with Built-in Risers will be available in June, and consumers can choose from white, ruby red or metallic carbon finishes. Colors will vary by model. Friend GE Appliances on Facebook to view how-to videos, learn about new GE appliances and join in the discussion with other GE appliance owners. Join today and follow @GE_Appliances on Twitter or just locate detailed information about our products at www.geappliances.com. 1. The Stevenson Company, August 2009. 2. The Stevenson Company. Data ranges from 2008 to 2011 and pulled from a second quarter 2012 Stevenson report. An average of 28.9 percent of consumers purchased pedestals for their frontload washing machines. Production employees work on the new GE frontload line. 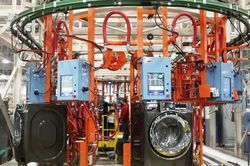 Two new assembly lines, costing over $100 million, have begun producing high-efficiency frontload washers and dryers, adding 200 jobs to Appliance Park in Louisville, Ky.
Shelly Schneidtmiller and Stefani Schultz, production employees, work on the new GE frontload line. Two new assembly lines, costing over $100 million, have begun producing high-efficiency frontload washers and dryers, adding 200 jobs to Appliance Park in Louisville, Ky.
Bryan Schroeder, Lindsay Wanalista and Michael Bahm, production employees, work on the new GE frontload line. 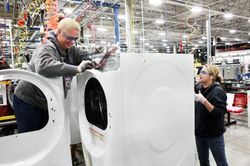 Two new assembly lines, costing over $100 million, have begun producing high-efficiency frontload washers and dryers, adding 200 jobs to Appliance Park in Louisville, Ky.